What?? I have a Twin Brother??? Now this was really awkward. I never expected something like this. I mean NEVER. This guy came to our place today, and it was really weird. He looked exactly like me!! 😯 “What an earth?” I thought. “He talks like me, he walks like me, he wears like me. What is going on here?” Then I began to think that something fishy is going on here. Should I call the police? 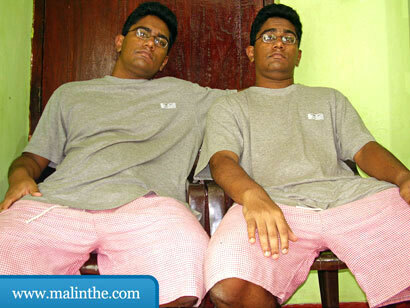 Did anyone invent instant cloning? Something like in The 6th Day? I don’t know. Better talk with this guy first. I greeted him and invited him for a picture with me. Luckily, this guy accepted. But I noticed that he was a bit skeptic about this photography thing. Well, nevermind. Here’s the picture below. What do you guys think? Strange, huh? What do you want from Malinthe's Note?